If you stand anywhere on Earth during the day, you see the sky and it's blue. But why is it just blue and could it have had a different color? If we had no atmosphere, the sky would be black. The atmosphere, or the air that we usually call it, consists of very small particles called molecules. The air consists of a mixture of nitrogen and oxygen molecules. To get an idea of ​​how large a molecule is, imagine a sand grain of 1 mm. You are guessing around 1-2 m long. Imagine that we enlarge you and an oxygen or nitrogen molecule so that it is as big as the sand grain. Then you get so long that your head is in Sweden while your feet are in South Africa. Let us settle for saying that they are extremely small and when the light from the sun moves near a molecule, the light can change direction. The light from the sun consists of white light. When it rains and the sun shines at the same time, one can often see a rainbow. Then you see that the white light consists of light with different wavelengths. We see it as different colors. Look at the picture below. Lights to the left (violet and blue) have shorter wavelengths and are easier for the molecules to spread in different directions. Light to the right (orange and red) is more difficult for the molecules to spread in different directions. Rayleigh scattering as this is called light or other electromagnetic radiation scattering in solid, liquid or gaseous matter. Rayleigh scattering occurs when photons are scattered against bound electrons. 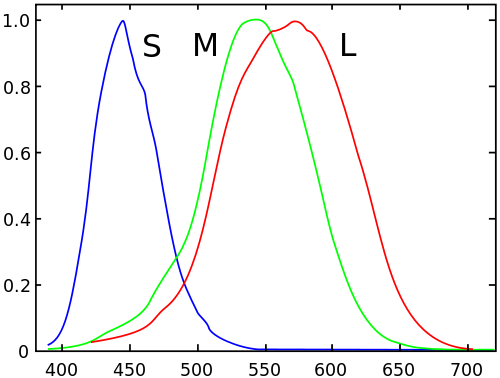 Because blue and violet sound are most widely spread, it is more likely that a photo of these colors will hit your eye than a red light photo. For a thorough review I recommend the film "Why is the sky blue? Thoroughly Explained Here!" Though there is a problem. 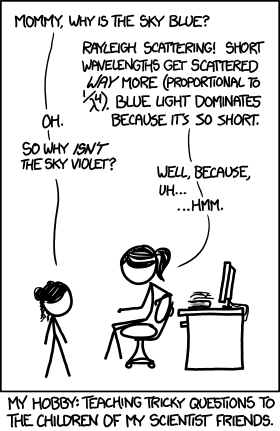 If now violet has even shorter wavelength than blue light. Why isn't heaven violet? It depends on how our eyes perceive colors. Our eyes have two types of photosensitive cells: pins and rods. Rods can only perceive how bright it is, but no colors. The pins are available in three types that are sensitive to three different wavelengths. Because of our eyes, we perceive the violet / blue sky as blue / white instead. Our eyes cannot see the difference between blue / white and blue / violet, just as we cannot see the difference between "pure" yellow light and a mixture between green / red. On the Youtube channel MinutePhysics, they explain why this is not heaven violet. Please see the film below where you explain how we see colors and why it is enough with three types of pixels (red, green blue) on the screens to see all the colors. För att hinna med att läsa böcker har många börjat lyssna på ljudböcker istället. Nu när de flesta har smarta telefoner så kan man ha ljudböckerna med sig alltid. Jag märkte att de ljudspelare som kommer med mobilen är värdelösa på att hantera ljudböcker. Personligen brukar jag hoppa mellan olika böcker och du kommer ljudspelaren så klart inte ihåg var man slutade. Med Smart AudioBook Player slipper du detta. Ljudboks informationen uppdateras om du tar bort/lägger till filer i samma katalog. Stöd för *.mp3, *.m4a, *. m4b, *.awb, *.ogg, *.wma-filer. Möjlighet att klassificera böcker (ny, oläst, läs). Möjlighet att lägga till romanfigurer i en lista för att lättare kunna följa historien. Skaparen av appen: Alex Kravchenko går själv igenom de vanligaste funktionerna nedan. Actionfigurer kommer alltid som ett brev på posten efter en barn/ungdomsrulle lämnar drömfabriken i Hollywood. Det finns en hel del Einstein dockor men nu har användaren datazoid på deviantart varit väldigt flitig med photoshop och producerat en imponerande samling vetenskapspersoner. Ta gärna lite tid på wikipedia och lär dig mer om dessa personer. Här finns en uppdaterad version. Bara att printa ut och sätta upp hemma eller i klassrummet. På julafton tittar en stor del av befolkningen på Kalle Anka. 1959 gjordes denna film om matematik med Kalle Anka i huvudrollen.